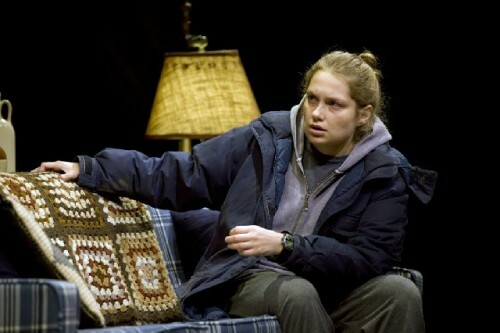 Emma (Merritt Wever) is mentally ill. Photos by T. Charles Erickson. For years Kay (Lisa Joyce) has been a guardian to her sister Emma. Kay’s boyfriend Billy (Michael Chernus) is suffering from writer’s block. Emma suffering a melt down during the first act. Sitting around the table in the cabin. Scenic Design, Andromach Chalfant; Costume Design, Emily Rebholz; Lighting Design, David Weiner; Sound Design, Jill BC DuBoff; Production Stage Manager, Hannah Cohen; Production Manager, Jeremiah Thies; Casting, Calleri Casting. 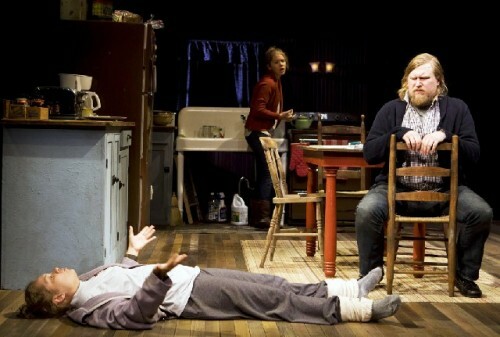 Cast: Michael Chernus (Billy), Lisa Joyce (Kay), Merritt Wever (Emma). 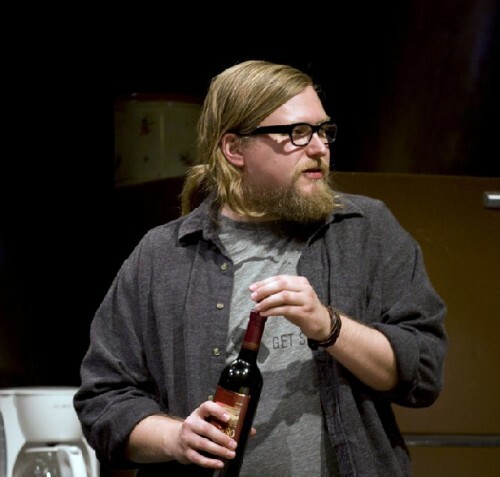 During the opening scene, a rustic cabin nicely evoked by designer, Andromach Chalfant, we see a couple Kay (Lisa Joyce) and Billy (Michael Chernus) going through kitchen cabinets and discussing various utensils that are placed in a cardboard box. We haven’t a clue why. Which largely describes the first act of a sad little ersatz drama/ comedy Touch(ed) by Bess Wohl. An object is held up for inspection and named. “Cheese Grater. It is used for Grating Cheese.” There is a titter of laughter from the audience. Again, an early indicator that this show is more or less supposed to be funny. Then, like us, it is dropped into the box. We wonder. Is the couple moving in? Or out? Having a yard sale? Are they Buddhists intent on reducing karma by ridding themselves of material goods? Who knows? And in fairly short order. Who cares? Then there is a squabble about the cork screw. Kay is adamant about getting rid of it. Why? Well it’s a sharp object. But Billy wants to hold onto it. Hides it from her. It’s useful. You know. For opening wine bottles. Is Billy an alcoholic? Is that the point? Should he not drink wine in a cabin in the woods? There is, after all, not much else to do. No TV. Although he seems to have WIFI for his Apple computer. We never are told how. Billy picks up the box to move it somewhere. Again, vague as to its destination. The bottom falls out and the utensils now litter the floor. The audience laughed. But the gag was also a subliminal indicator that the bottom was rapidly falling out of a rather slight play being propped up with the usual stunning production values of the Williamstown Theater Festival. Again, as it was with Three Hotels, Streetcar Named Desire, Doll’s House, and She Stoops to Conquer, the sets upstage the plays. During her first season as artistic director of the Williamstown Theatre Festival Jenny Gersten has established a diffrerent paradigm for the smaller Nikos Stage. Until now it has been a laboratory for new work. This season there has been a mix of old- Steetcar, Doll’s House- and new. This is the second more or less new work. The other was a comedy by Lewis Black, One Slight Hitch. At least we knew that was a comedy. This time we are not so sure. 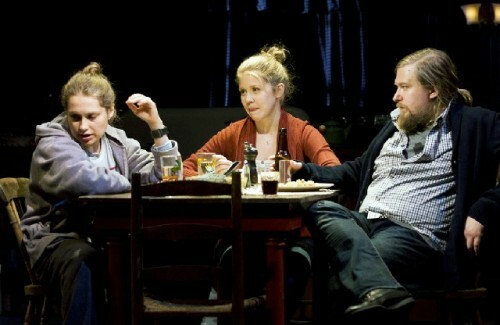 The Nikos season will end with another new play You Better Sit Down: Tales from My Parent’s Divorce by The Civilians. Now doesn’t that sound like fun? Touch(ed) had its world premiere at Pioneer Theatre Company in Salt Lake City, Utah, January 8 to 23, 2010. The premise of WTF is that, as a festival, it presents a mix of works old and new. It is an opportunity for artists to develop material. As is the case here. Or to delight audiences with old chestnuts and established players which was the case with Nicholas Martin’s production of the vintage She Stoops to Conquer with its all star cast. Recently, we asked Martin, the former artistic director of WTF, whether sending plays from Williamstown to Broadway and Off Broadway was an indicator of the success of the programming? In the past WTF has launched a number of productions that have had successful runs in New York. Martin was adamant in denying that as a mandate for WTF. If we follow that argument then Gersten is off the hook. The play that she intended to launch the Main Stage season You Can't Take It with You by George S. Kaufman and Moss Hart was planned to have a tune up at WTF on its way to Broadway. That would have been quite a coup but it fell through. So far, with two more productions left in her initial season, none of Gersten’s plays appear to be headed for New York. It would have been nice, but, as Martin emphasized, that is not the point. With a lot more work One Slight Hitch and Touch(ed) may have a future. But, right now, both look like long shots. Oh yes. The cork screw. It seems that Kay, a school teacher, and Billy, a more or less successful author with writer’s block, were attempting to suicide proof the kitchen by removing all of its sharp objects. They are about to be joined by her sister Emma (Merrit Wever) on leave from a mental institution. As the first act progressed at a snail’s pace it was difficult to become involved or really care about the characters and their challenges. Perhaps this implies a callous attitude toward the issue of mental disease and its devastating impact on families. Actually, the issue proved to be too personal and close to home to enjoy an ersatz comedic treatment as is the attempt here. The first act is squandered as little more than a setup for the more compelling and successful second act. Perhaps the author might dump the first act, start with the actions of the second act, and include flashbacks. Reduce the whole thing to one act in 90 minutes. Anything, but please, not that plodding first act. The intention of Kay was just to invite Emma for the weekend. To celebrate her birthday. Although she does not wish to be reminded of the passage of time. Particularly when she is so troubled that there is nothing to look forward to. We never quite understand how they manage to prepare meals with no kitchen utensils. And what about that cake that is or isn’t a birthday cake. To resolve the dilemma of the cake Wohl scripts a food fight between Billy and Kay. Oh please. How ridiculous. Then they screw on the couch. Good grief. At the end of the weekend Kay is ready to head back to the city. She has to teach on Monday morning. Billy has no job to get back to and decides that the isolated cabin may stimulate his creative juices. On a whim he proposed that Emma may stay with him. Emma, a paranoid schizophrenic, manages to cope with a daily regimen of medications. All with vividly described side effects. For years Kay has been looking after her. At a personal cost that we discover when she explodes during the second act. Some weeks pass when Kay comes to visit. They have a secret to share with her. Both we and Kay assume that they mean to reveal that they are sleeping together. No. Not that. It seems that Emma is now off her meds. Like totally. Not just that. They are both now vegans. And have given up coffee, yet another “drug.” But not the occasional beer. Kay, completely out of synch with all of this, arrives with groceries. She unpacks stupid stuff like soda and chips. Yuk. There has been an awkward reversal. Emma is now the thriving, upbeat sister, jogging around the lake, all by herself, seven miles a day. And spewing out reems of poetry. While, guess what, Billy is making progress on his novel. Everything is copasetic. Except, of course, for Kay. It seems that Billy has gone on line for all kinds of ersatz scientific research. In a matter of weeks, and a quite life in the woods, he has reversed years of incapacitating mental illness. Except that, Kay doesn’t buy it. In a confrontation she reminds Billy that he has earned an MFA not an MD. Of course, Billy counters, and we want to agree, the treatment and over medication of mental illness are just atrocious. We would like to believe that a holistic approach really works. Oh what a better world it would be if we all followed macrobiotic diets, meditated, practiced yoga, and took regular coffee enemas. When push comes to shove Kay explodes in the screed of love/hate/resentment that is the fulcrum of the drama. It is the tipping point goaded on by Billy’s accusations of co-dependency. That Kay needs for Emma to need her. Over the top Kay blurts out that she just wishes that Emma would finally get it done and off herself. The unthinkable surfaces. Arguably, it is a horrible possibility buried deep in the heart of all who endure decades of caring for a family member or loved one. There is an awkward final scene. Following the argument Billy leaves for a local all night diner. There to just be alone. Emma who has been upstairs finds an upset Kay. Did she hear the argument and its hateful revelation? Emma claims that she didn’t hear. Do we believe her? She urges Kay to go find Billy and patch things up. Alone at the kitchen table, under a slowly fading light, we watch as the set moves back and disappears. A black wall drops and on a bare dark stage we find Billy at a table drinking coffee and writing on his computer. Kay enters. We assume that it is the all night café. Clumsily, it is revealed that it is not that night but some time later. They are no longer a couple. Billy had published the book which he dedicates to Kay. He says that he had thought about dedicating it to Emma as well. She is deceased. A suicide. It happened that night. Did she hear the argument? Billy strongly counters that nobody kills themself because of what somebody else says. We are left to connect the dots. At best it sends us home thinking of our own troubled and lost loved ones. It was a place that, I for one, did not enjoy revisiting. Had the play been better written and presented I might think differently. Playing mental illness and family tragedy for laughs isn’t very funny.